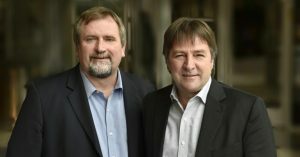 Mark Hancock, National President (left) & Charles Fleury, National Secretary-Treasurer (right). CUPE Saskatchewan endorses incumbent National Officers for re-election. The Executive Board of CUPE Saskatchewan has endorsed incumbents Brother Mark Hancock for re-election as National President, and Brother Charles Fleury for re-election as National Secretary-Treasurer, ahead of the elections to be held for National Officers at the upcoming CUPE National Convention in Toronto on October 2 to 6, 2017, at the Metro Toronto Convention Centre. Brother Mark Hancock was first elected National President in November 2015, following two terms as president and four terms as secretary-treasurer of CUPE BC. Mark Hancock is the 6th National President of CUPE. Hancock became a CUPE member in 1984, and served fifteen years as president of Local 498 representing Port Coquitlam Municipal Employees. Brother Charles Fleury has been the National Secretary-Treasurer since 2011. Fleury became an active member of CUPE 35 years ago, when he started working for Hydro-Québec. In addition to the election of National Officers, positions on the CUPE National Executive Board will also be elected at the upcoming National Convention 2017. The CUPE Saskatchewan Annual Convention has endorsed Sister Judy Henley for re-election as General Vice-President and Brother Tom Graham for re-election as Regional Vice-President on the CUPE National Executive Board. Henley is the Secretary-Treasurer of CUPE Saskatchewan Division, and Graham is the President of CUPE Saskatchewan Division. For delegates of Saskatchewan locals attending the National Convention 2017, the Saskatchewan-Manitoba Caucus will be held on Sunday, October 1, 2017, at 7:00 p.m. in the South Building, Room 717, at the Metro Toronto Convention Centre. The National Officers of the Canadian Union of Public Employees are the National President and the National Secretary-Treasurer, and the positions are elected by majority vote of delegates at each regular biennial National Convention. Elections for the National Officers are scheduled the morning of Wednesday, October 4, 2017. Elections for General Vice-Presidents are held in the morning of Wednesday, October 4, 2017, and elections of Regional Vice-Presidents are held in the morning of Thursday, October 5, 2017.